Like many other commentators, George Monbiot suggests that “to retain the moral high ground we have to be sure that we’ve got our own house in order. That means demanding the highest standards of scientific openness, transparency and integrity”. It’s hard to argue with these abstract ideals. But I’ll try, because I think this assertion is not only unhelpful, but also helps to perpetuate several myths about science. The argument that scientists should somehow be more virtuous (than regular folks) is a huge fallacy. Openness and transparency are great as virtues to strive for. But they cannot ever become a standard by which we judge individual scientists. For a start, no scientific field has ever achieved the levels of openness that are being demanded here. The data is messy, the meta-data standards are not in place, the resources to curate this data are not in place. Which means the “get our own house in order” argument is straight denialist logic – they would have it that we can’t act on the science until every last bit of data is out in the public domain. In truth, climate science has developed a better culture of data sharing, replication, and results checking than almost any other scientific field. Here’s one datapoint to back this up: in no other field of computational science are there 25+ teams around the world building the same simulation models independently, and systematically comparing their results on thousands of different scenarios in order to understand the quality of those simulations. We should demand from scientists that they do excellent science. But we should not expect them to also somehow be superhuman. The argument that scientists should never exhibit human weaknesses is not just fallacious, it’s dangerous. It promotes the idea that science depends on perfect people to carry it out, when in fact the opposite is the case. Science is a process that compensates for the human failings of the people who engage in it, by continually questioning evidence, re-testing ideas, replicating results, collecting more data, and so on. Mistakes are made all the time. Individual scientists screw up. 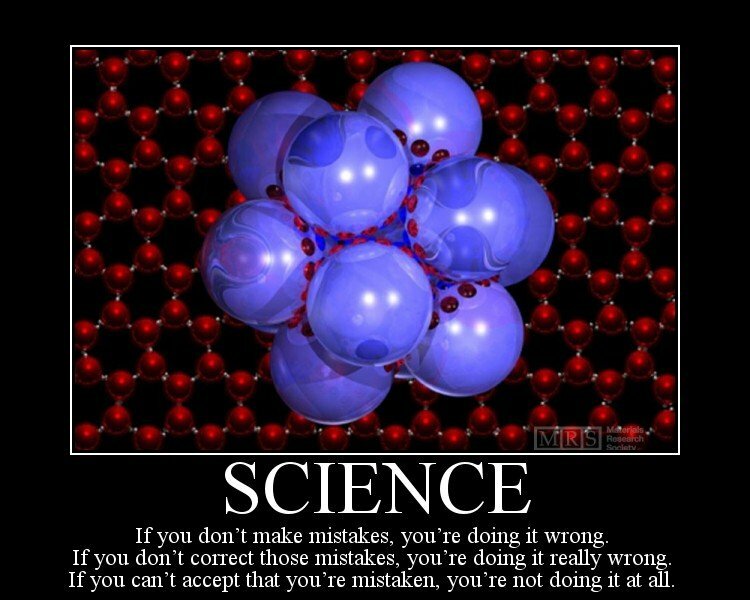 If they don’t make mistakes, they’re not doing worthwhile science. It’s vitally important that we get across to the public that this is how science works, and that errors are an important part of the process. Its the process that matters, not any individual scientist’s work. The results of this process are more trustworthy than any other way of producing knowledge, precisely because the process is robust in the face of error. In the particular case [of the CRU emails], calling for scientists to take the moral high ground, and to be more virtuous, is roughly the equivalent of suggesting that victims of sexual assault should act more virtuous. And if you think this analogy is over the top, you haven’t understood the nature of the attacks on scientists like Mann, Santer, Briffa, and Jones. Look at Jones now: he’s contemplated suicide, he’s on drugs just to help him get through the day, and more drugs to allow him to sleep at night. These bastards have destroyed a brilliant scientist. And somehow the correct response is that scientists should strive to be more virtuous?! Oh yes, blame the victim. Suggesting that Jones should resign is defensible without appealing to perfection. Pragmatic considerations suggest that it might have been a good move, from a public relation point of view. The main problem is that there is a possibility that the resignation would not alleviate any political pressure. From the point of view of warfare, the suggestion is absurd: no game has ever been won by resigning. George Monbiot appealed to moral grounds to formulate a prescription. But it seems to me that it can only be an honest personal advice, unless we are ready to enter into a deontological debate. From a moral standpoint, only Jones should know better what Jones has to do. Come what it may, here is a simple algorithm. First, declare that you only want better science. Second, act as relentlessly and ruthlessly as your own self-righteousness inspires you. Third, if someone points out that you’re acting like a pig, reiterate that you only want better science, after all. To remember the algorithm, cf. **Mars Attack**. Spot on, Steve. Really appreciating your commentary on this. Your “sexual assault” analogy could be extended – Jones and his colleagues had been harried and assaulted for over a decade, before the ‘final’ attack took place. And yet, to Monbiot, the girl is to blame. As though any scientist could “redefine” the peer-review literature! Jones even used an explanation mark to denote the flippancy of that comment! George seems to have abandoned this line of attack now and shifted his argument – a good sign it was flawed from the outset. Sometimes it happens that some resignation is all what it takes for an institution to save its face. And sometimes that’s not what it needs. Who knows? The person to knows that should sell his trick and become very rich. If the reaction of contrarians dictate what you do, your behaviour will soon end up as caricatural as theirs. Nothing will prevent contrarians to act like contrarians. Isn’t that what they are doing right now? Just suppose for a moment that Jones resigned. (He could have believed that this was for the best, or that he’s fed up, or else: no one can’t deny that he could have resigned.) We can all bet that the contrarians would have proclaimed victory, and at the same time denounced in spite that someone was thrown under the bus. This week The Science Show presents excerpts from a symposium at the recent American Association for the Advancement of Science meeting in San Diego which looks at the sources and strategies of scepticism to climate change science. Somehow, I think it’s a bad idea to construct and promote an argument to the effect that Jones should stay, out of scientific duty, say. He should be made free to decide whatever he wants. The health of a man is more important than all the blog wars added together. Which means the “get our own house in order” argument is straight denialist logic – they would have it that we can’t act on the science until every last bit of data is out in the public domain. Because I have recommended that an active, aggressive role be played by the numerical analyst and that he get into the design stages of the problem and stay in through the interpretation and decision stages, it seems necessary to also suggest some restraints on his role. The following could serve as commandments. 1. Thou shalt not impose your ideas, opinions, and prejudices on the customer, for he is the man with the problem, not you. 2. Thou shalt avoid all unnecessary fancy mathematics, computer jargon, and attempts to raise the “falutin’ index” of the problem. 3. Thou shalt not come between the customer and the machine, but shall stand at one side ready and willing to give all the help and aid you can to both. In this case the public is the ‘man with the problem’ so it’s probably a good idea to let them take a peak under the hood if you want them to act. There are plenty of other fields where every bit is available for scrutiny. Why the call for climate science exceptionalism? If you don’t want to / can’t release some bits, then don’t use them in the decision support package! Otherwise, stand and deliver. Because As We All Know, The Green Party Runs the World. Peter Watts’s Climategate posting was chosen as one of the “50 Best Science Blogging Posts of the Year“. It’s a good refutation of many of the illusions we see being declaimed about science. Steve, thanks for your spirited defence of climate scientists. I attempted a reply to Monbiot in the other thread, but in doing so I myself largely ignored the human side of the debate (and my analogy was pretty terrible, on reflection). The attacks on Jones need to be seen for what they are – not righteous, but utterly pointless, heartless, ruthlessly pedantic and yet hopelessly ignorant, wholly unscientific and ultimately misanthropic. Jones is at the forefront of a scientific endeavour that may yet save civilisation from some of the worst effects of humanity’s own behaviour. What are McIntyre’s contributions compared to this? What are the contributions to humanity of any of those who’ve attacked Jones? Monbiot should have been calling for Jones’s confession, not his resignation. Had he been, I would have been fully on his side. Jones’s response has been hopeless. I understand that he was panicing and just wanted to hide, but that was disasterous and has been taken by many as an admission of guilt. What Phil Jones simply must do is to write a long letter detailing his side of the story, like Ben Santer did on RealClimate. He now probably needs to wait for all the inquries to be over, but he should have done it immediately. What would a resignation solve? Nothing. He needs to start talking, not resigning. Steve, I think that to call Jones “destroyed” in any sense is an overstatement. Steve’s doing a brilliant job of explaining to George Monbiot why he should abandon his vendetta against Phil Jones and rethink his entire approach. He’s also wrong about the order, by a year or more, and he’s wrong about the nature of the data CRU and therefore Jones were withholding. Part of obtaining that data was obtaining it from its sources. For years, CRU told people wanting the data that they weren’t the primary source, and moreover, how to get it. For Monbiot to say or imply that they were and are the primary data source is a real scandal, frankly. The bottom line is, Monbiot has become a willing agent of people practicing “tobacco science” in their campaign to create doubt and delay. I’m not sure how many overheated feel-good op-eds by him will offset that.